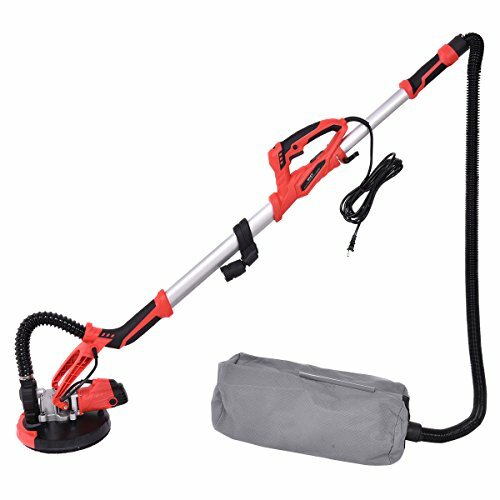 This is our portable drywall sander, which is suitable for drywall construction, inner and outer surfaces of the ceilings and walls, including those hard to reach parts, exterior wall, corridor, adhesive and loose plaster. This machine is designed with vacuum function, can reduce the dust when sanding effectively. It is lightweight and easy to operate. It reaches corners and edges help to get the job done well. 【Variable Speed Control】Speed can be set from 800rpm to 1,500rpm, this drywall sander is ideal for different surfaces like drywall construction, inner and outer surfaces of the ceilings and walls, including those hard to reach parts, exterior wall, corridor, adhesive and loose plaster. 【Dim Place Helper】Angle adjustable LED light design, no need to lift another light any more in a dim place. 【Portable Moving】This machine is lightweight and easy to operate, can access to corners and edges with less labor and time. 【6Pcs of Sanding Disc】The package comes with 6pcs round sandpapers which involved different forces of friction to choose. 【Accessories Include】6pcs sanding paper, 1pc vacuum bag, 1pc carbon brush, 1pc internal hexagonal wrench and 1pc soft tube.